We’d love your help. Let us know what’s wrong with this preview of Captain Grey by Avi. "I shall find a way to get free." "Free!" he shouted. "You are here, with us now. You can forget about your father and your sister, or anybody else you may have known. You belong to no nation but this nation. Put him back where he was and don't feed him. Tomorrow we shall talk again about freedom!" To ask other readers questions about Captain Grey, please sign up. I am usually a big fan of Avi's work, but I had a hard time getting into this book until almost two-thirds of the way in. However, a nice young readers adventure story. Not his best but still a good storyteller. This book started out with Kevin and his sister, Cathleen who was born in the City of Philadelphia. Cathleen was 2 years older than Kevin, but their mother died during Kevin's birth had fled Ireland to go to America with nothing but his hate of the English. When the War of Independence took hold of the Americans, he left Kevin and Cathleen to take care of their mother's cousin, Mrs. Barry. Mrs. Barry was low on money, so she was always worried about food. Kevin and Cathleen weren't accepted by o This book started out with Kevin and his sister, Cathleen who was born in the City of Philadelphia. Cathleen was 2 years older than Kevin, but their mother died during Kevin's birth had fled Ireland to go to America with nothing but his hate of the English. When the War of Independence took hold of the Americans, he left Kevin and Cathleen to take care of their mother's cousin, Mrs. Barry. Mrs. Barry was low on money, so she was always worried about food. Kevin and Cathleen weren't accepted by other children, so they would run into distant forests in which they wanted to live like Indians than people of the city. After the war over a period of 7 years, their father returned to them, he decided he did not want anything to do with the government so they moved to the southern wilderness of New Jersey. From there, their father searched for a place that did not benefit from the government, Kevin and Cathleen survived because of their Indian arts. They built a camp and then camped there for 3 days, but their father hadn't done a thing but think about the government. Suddenly, on the third day they heard a shot from a pistol and they found a group of men surrounding them, they were pirates. The captain demanded their father to get up but he refused, so the captain smacked him to see if it worked, and it did. When the captain had mentioned government, the father reached for one of the pistols on the captain's belt, but he was countered, dropped on the floor and killed by the captain in an instant. They then captured Kevin and left the sister behind, Kevin assumed she was dead. They kept him in custody for sometime, but later, he was given the freedom to fight for the pirates and raid ships. I can relate this to another series, Reborn!, in both these texts, there is a boy who is rejected by normal children, he chooses not to fight but some figure would awaken their fighting spirit which they are blessed with. I picked this up to read between the biography "The Bashful Billionaire" and "The Patchwork Planet", both adult reads. I have been reading Avi's books for a while and am attempting to have a complete collection of his. Granted the book is for kids, but it offers excitement, mystery and adventure that even adults can get into. It is 1783 and pirates do exist. Kevin Cartwright has been kidnapped by one of the most murderous ones around, Captain Grey. Grey and his band killed his father and sister bu I picked this up to read between the biography "The Bashful Billionaire" and "The Patchwork Planet", both adult reads. I have been reading Avi's books for a while and am attempting to have a complete collection of his. It is 1783 and pirates do exist. Kevin Cartwright has been kidnapped by one of the most murderous ones around, Captain Grey. Grey and his band killed his father and sister but kept Kevin. Why? What will they do with him? Captain Grey has established his "Free Nation" in a cove on the New Jersey shore. There is a 'sand island' that sits across the opening to the cove and provides cover so the the pirates can watch the traffic of the ships that go up and down the coast without being seen. A perfect set up to allow them to pick and choose their victims for plundering. Captain Grey trains Kevin in the way of the pirates and lets Kevin know that he is now 'one of them'. Kevin still can't figure out why, and keeps hope that some how he will be able to escape from these men. When a pigeon shows up in the attic room he is given, he starts a friendship with it. The friendship will lead to much more....more than he imagined. The story is mainly focused on a boy named Kevin that is captured by Captain Grey and his crew. When Kevin is captured he is kept locked up until he agrees to become a pirate.Kevin then is later shown by Captain Grey the methods in order to survive and take his place as captain if he were to die. Kevin goes trough 2 sea battles being part of is experience on how to fight. Throughout the book Kevin spends 25 days until he can be freed. My favorite line is "Well, Master Freeman Kevin" this line infers that Kevin wants freedom and he will refuse to anything that will prevent him from being free from his captors. This line is when Captain Grey was trying to convince Kevin to either become a pirate and work for him or he will not get his freedom back. Well I think that this book is really interesting because the Captain is not a mean captain but a tough person because situations in his life have made him that way. The same as Kevin his character as a person makes him stand out because he stands up for what is not fair but he is also not afraid of captain Grey. I give 3 stars to the book because Kevin and Captain Grey confrontations within each other made it fun to keep reading. This review has been hidden because it contains spoilers. To view it, click here. I agree with other reviewers. It's a bit grim and the ending seems rushed. I wish Goodreads gave out half stars as I think this one would be a 2.5. I'm beginning to see a pattern/formula in some of Avi's stories in how some of his main characters are so poorly treated by everyone to get them into the predicament they have to deal with, so perhaps expecting this took away a bit of the fun. Good, but not great. One of the best, most interesting children's stories that I have read in quite some time. I appreciate Avi's style - it is very authentic and sounds like it was written in an older time period. That said, the ending did disappoint me just a little bit. I'm not sure how I wanted the story to culminate, but not the way it did. Love the strong sister in this YA book. She survives alone in a pigeon cave, schemes to get revenge on the pirates who killed her father and captured her brother. Aggressive, strong, determined - yeah! loved this one... funny, historical aspect of Revolutionary war time period. Great for preteen reading age group, but one that will be enjoyed by all. A pirate tale told from shore. It's exciting and fast paced trying to out think the old captain. 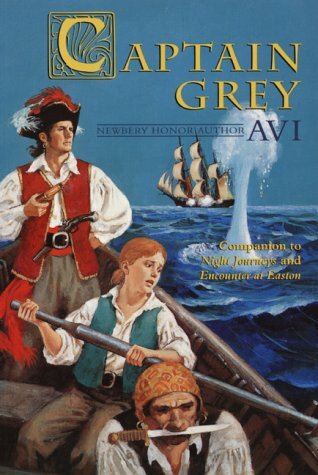 Grim story of a boy captured by a group of embittered men, led by Captain Grey, who turn to piracy. They capture ships, take no captives, and then sink the ships. Good action read for 4/5th graders. In 1783, young Kevin Cartwright is kidnapped by the mysterious Captain Grey and his crew of pirates after they kill Kevin's father and sister.